On this modern house extension in Thames Ditton features The urban glide 22 sliding doors system. giving you a flawless view of the outside. 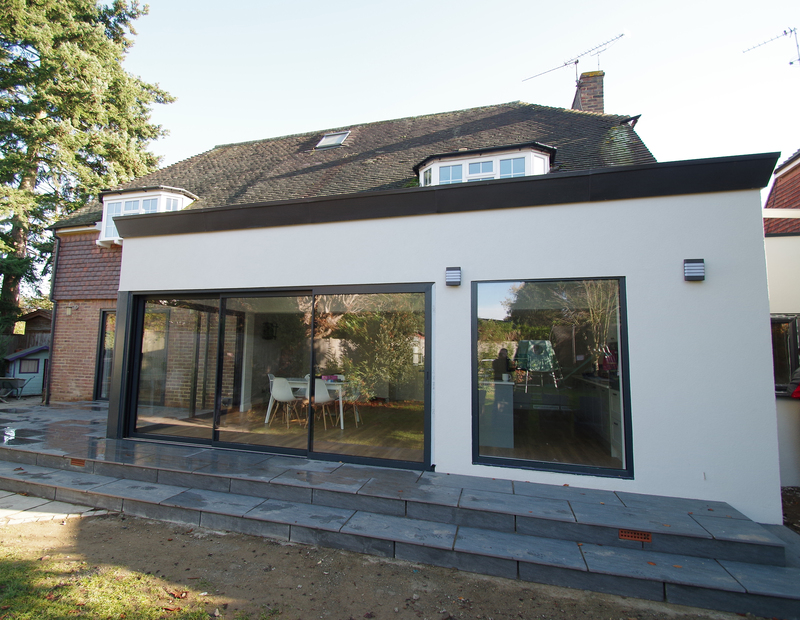 This home renovation creates a beautiful, elegant glass extension using our exclusive minimal aluminium framed windows sliding door system. Have a similar project in mind? Send a message on our Contact Form or call 020 8979 6367 to speak with an expert. Each glass panel is 22mm thick which is how this product was given its name. It allows natural light to shine in through to the new kitchen and dining room without any obstruction. Through the use of special safety glass, you can enjoy wide, uninterrupted views whilst enjoying the same protection and security you would with even the most traditional main doors. Including in this project was a picture window and roof sky lantern light which completes the home renovation with an extension with a great view of the garden. As a bespoke supplier of stunning aluminium glazing systems across London and the Home Counties, at Urban & Grey we believe firmly in the quality and sustainability of aluminium window and door solutions for our customers. 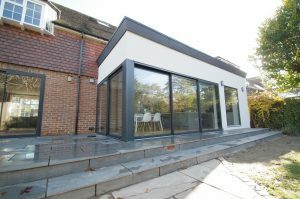 With that in mind, we thought now would be an opportune moment to attempt to dispel some common misconceptions about aluminium glazing and reaffirm just why demand for aluminium systems is higher than ever before across the south-east of England. Although no new double glazed window solution – whether it’s aluminium or PVCu – will 100% eradicate the prospect of condensation, aluminium windows adopt sophisticated thermal break technology that offer the ultimate in energy efficiency for homes. Those experiencing condensation may simply need to consider improving the air flow in their home. It is a complete myth that aluminium windows can only be fitted onto hardwood subframes. 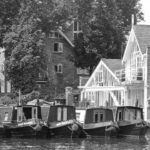 There are some instances where a building’s original hardwood surrounds may remain as the property owner seeks to maintain the period character of the building, but equally, aluminium windows can be fitted direct to the structure – without the need for existing frames. One of the biggest misconceptions surrounding aluminium glazing systems is that they are not secure because they are externally glazed. Wrong! In the same manner as PVCu and timber windows and doors, every aluminium system that Urban & Grey sell undergoes independent third-party security testing to PAS 24 and Part Q Building Regulations standards; ensuring they are fit for purpose and can withstand attack from an opportunist burglar. Contrary to belief, aluminium windows and doors can be finished in virtually any colour – from metallic shades to pastel colours. This is achieved using a process called powder coating, enabling property owners to choose a window or door design and a colour that truly reflects their personal taste. It is a disappointing misconception that aluminium glazing systems break the bank. Reputable suppliers like ourselves will always offer products at the fairest price possible. Equally, their outstanding build quality and performance means that an investment in aluminium windows is an investment for the long-term – they’ll require very little ongoing maintenance. The structural integrity of aluminium windows should never be called into question. Even with thinner frames and minimal sight lines, aluminium frames can hold significantly larger panes of glass than comparable PVCu products. So with stronger aluminium windows you’ll be guaranteed better external views that won’t be ruined by any unnecessarily bulky features. Questions? Send a message on our Contact Form or call 020 8979 6367 to speak with an expert. Insurance-backed guarantee from Home Pro Insurance – Offering peace of mind, by protecting your deposit, your installation and your warranty.